You may have figured out by now that I have a bit of a sweet tooth. And after the Hot Chocolate Layer Cake with Homemade Marshmallows, I thought I would take it easy on you (and my family, of course). You might be asking yourself, "frozen dessert in winter?" Yes, absolutely! Ice cream, sorbets, sherbets, and frozen yogurt are year 'round treats for me. This frozen yogurt is one that I prepare all year long and is a nice departure from the store bought/chain operation frozen yogurts out there. For a low fat and rather plain dessert, the taste and texture are anything but ordinary. In the winter, I use Greek yogurt for a rich, tangy flavor. In the summer, I use plain yogurt for a lighter and tasty spoonful. The key ingredient for the creamy, cloud-like texture is beaten egg whites and yes, they are raw. Just make sure your eggs have clean, unbroken shells and crack them on a flat surface rather than on the edge of a bowl to prevent any possible bacterial contamination. If you are still concerned about the use of raw eggs, you can use powdered egg whites instead. Just beat them according to the manufacturer's instructions. One beautiful thing about this yogurt is that it is good any time of the day. Top a scoop with a drizzle of honey and granola for breakfast. A bowl in the afternoon with some fresh fruit is great way to keep you going. My favorite way is a big spoonful after dinner to cleanse the palate and satisfy that sweet tooth of mine without any guilt. In a clean and dry medium bowl, beat the egg whites until frothy with a wire whisk or hand-held mixer. Gradually add the sugar; increase the speed to high and beat until glossy, stiff peaks form, about 4-5 minutes. In a separate bowl, whisk together the yogurt and vanilla until smooth. Gently fold in the egg whites. Cover with plastic wrap and refrigerate until cold, about 1 hour. 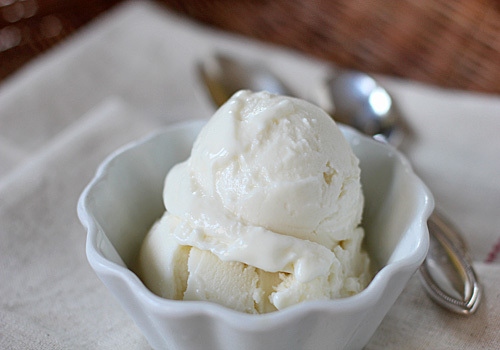 Transfer the mixture to an ice cream maker and freeze according to the manufacturer's instructions. Enjoy! 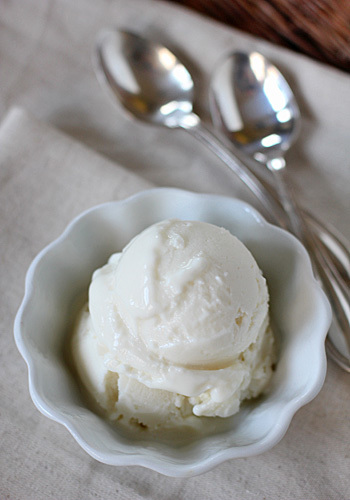 Ice cream - uh, frozen vanilla yogurt - for breakfast!! What a wonderful idea. Frozen Yoghurt Vanilla, the best!